AAE welcomed this young gelding from the DreamCatcher Wild Horse and Burro Sanctuary in September 2017 to support DreamCatcher's recovery and herd reduction efforts (focused on rehoming young/captive born mustangs). DreamCatcher is in a recovery period after the long illness and passing of their Executive Director, Barbara Clarke in November of 2016. There are many more young ones in need of homes. Ford is a handsome and curious guy, but quite untrusting. He came to AAE after a failed attempt in a gentling program. He landed at AAE for a layover in transportation with two other somewhat overwhelmingly dominant geldings as they were making their way back to DreamCatcher. He seemed to find himself unwittingly between the antics of the other two, and the poor guy couldn't seem to catch a break. He had a kind eye and an inquisitive nature, but for intimidation by the other two. He seemed to be a good fit here at AAE, so we held him back when the trailer came for the boys. Ford has recently been haltered, but needs more time building trust and confidence with humans. 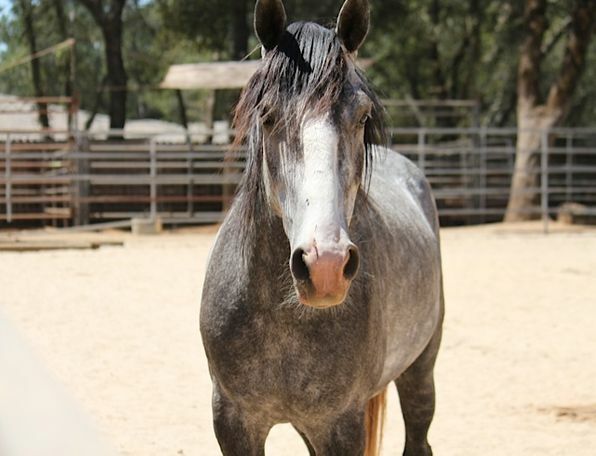 He has some fight in him (protective in nature), and will need someone very experienced with mustangs and someone that respects their reactivity and personal safety. He'll need a big time commitment to daily handling with plenty of consistency. Until then, he'll continue building trust and slow progress here. Ford is enjoying pasture life with the herd, and he is slowly softening with humans. He'll be looking for a home soon after he's brave enough for a dental exam and hoof trim.